I remember sitting at home watching MuchMusic in July of ’87. The Power Hour was on and they played “Here I Go Again”. 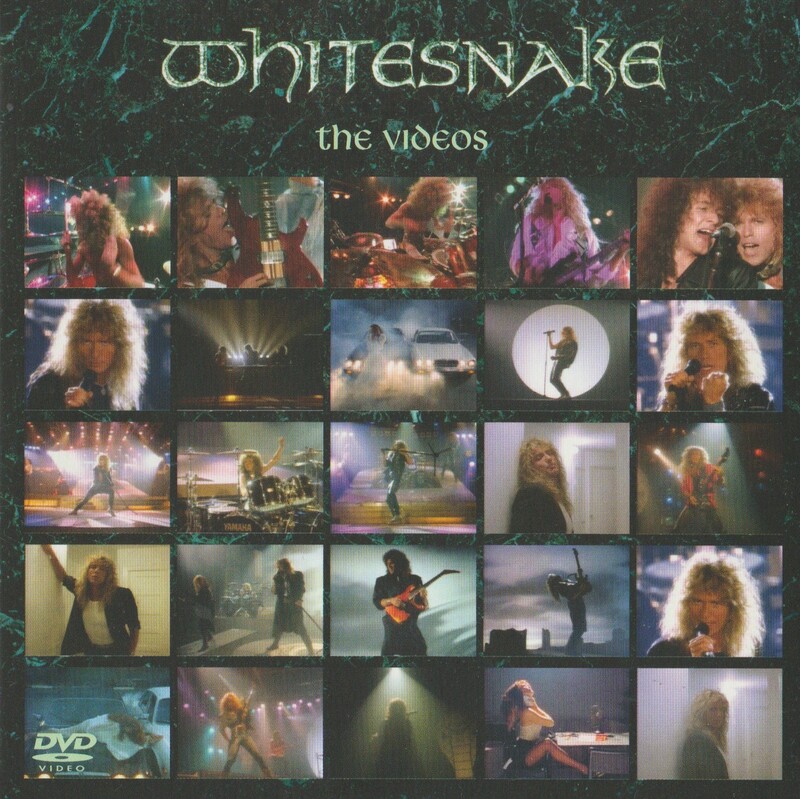 It was my first time hearing Whitesnake and I hit “record” on the VCR. This was and still is a great album, although it was a lot heavier than I expected back then. Also, if you’re from the 80’s you’ll remember this, the cassette was so tight that it always played slow in my tape deck. So it always sounded frickin’ awful for me and it wasn’t until I picked it up on CD sometime in the 90’s that I really gave this album a chance. It’s overproduced all to hell, even excessive by the standards of the time. But my God it does some crunch to it. John Sykes on guitar saw to that. Neil Murray remains on bass, but buried inaudibly beneath a very dense mix. Aynsley Dunbar subbed in on drums, a very busy drummer, but it actually works. There are a few moments, particularly during “Crying In The Rain”, where he overdoes it, but in general he was exactly the kind of drummer needed to elevate the album to this caliber. If you’re looking for the radio hits, they are pretty much all on this album, so just click “buy” on whatever site you choose. Or visit your local brick-and-mortar and see if they carry it. In any case this album goes beyond just the four hit singles. The aforementioned “Crying In The Rain” (a re-recording from Saints An’ Sinners, same as “Here I Go Again”) is a crucially important album track, as is “Don’t Turn Away”, a rocker/ballad closer that has some of Coverdale’s best singing. But wait, there’s more. 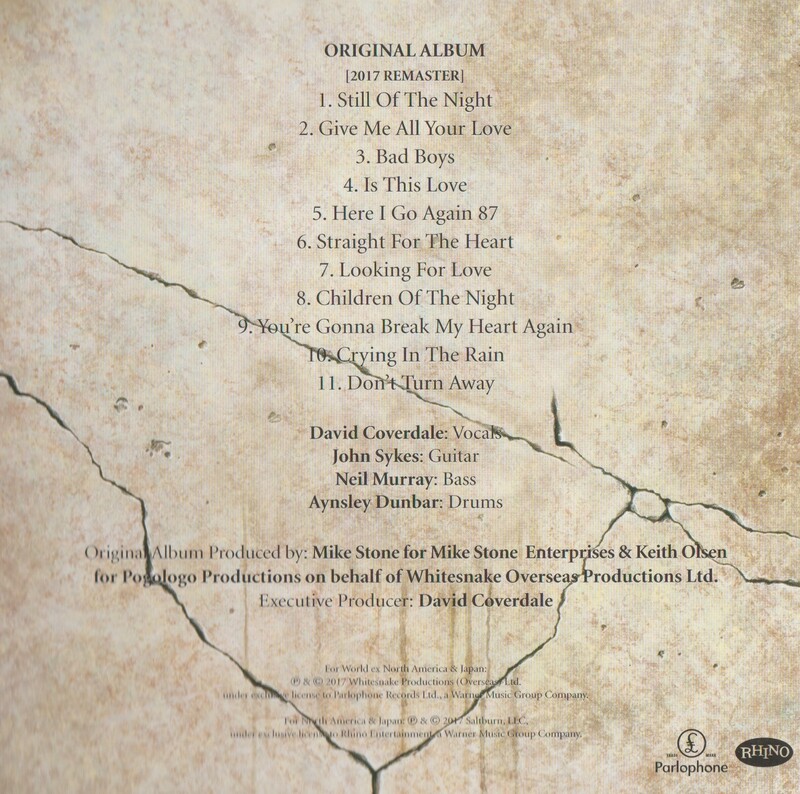 The album has included the addition of the two songs that are usually only available on the UK version: “You’re Gonna Break My Heart Again” (awesome fast rocker, totally album worthy) and “Looking For Love” (ballad). I like what they did here — they maintained the track order of the US version (my preferred version) and put in the two UK tracks within the tracklist (tracks 7 & 9). It just works better in my opinion to have “Don’t Turn Away” at the end of the album. Then I hate what they did next. 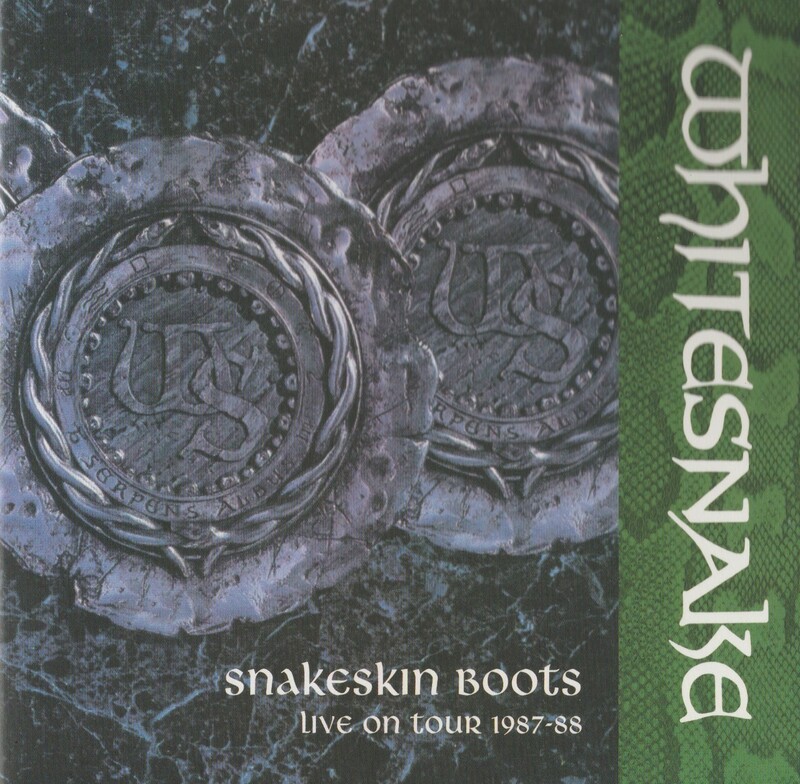 Instead of giving you era B-sides or live songs, they stick on four live versions by a later version of Whitesnake, readily available on a common live album. (Live versions of the four big singles.) What could have been included instead: the “single version” of “Here I Go Again” which is a completely different mix! The single version of “Give Me All Your Love”, the only recording to feature guitar playing from Vivian Campbell (the solo)! Or hell, even live recordings from the era? Anything but these live duplicates from a much later time. There is a bonus DVD included. The four music videos and then, again…the same four damn live songs! Also by a later Whitesnake, from a common live DVD. Jesus Murphy! Booklet and liner notes are decent at least, but not enough to justify me owning this any longer. 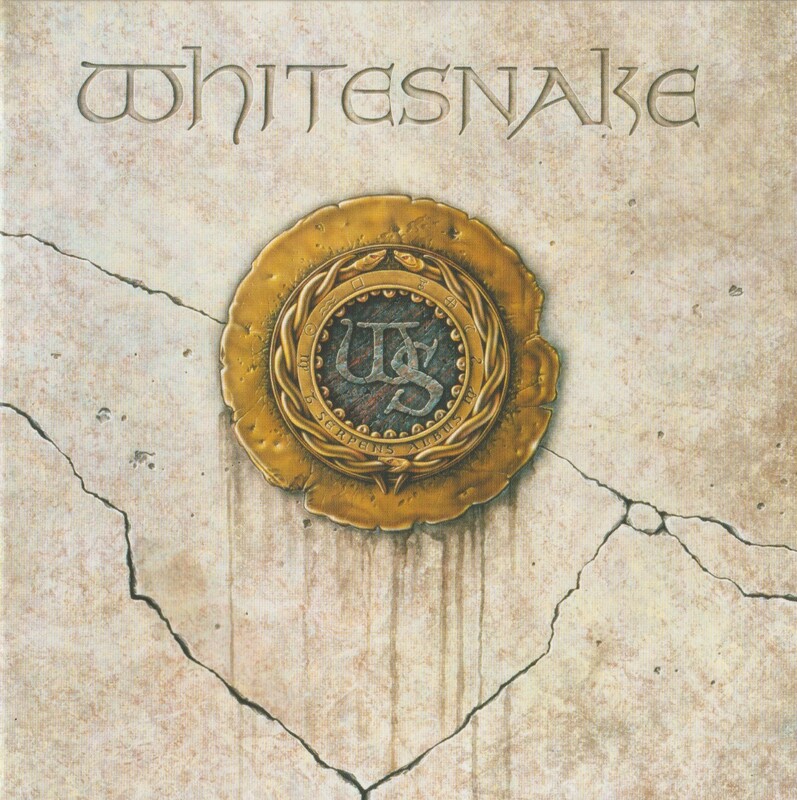 My recommended edition: Here I Go Again: The Whitesnake Collection (2CD). 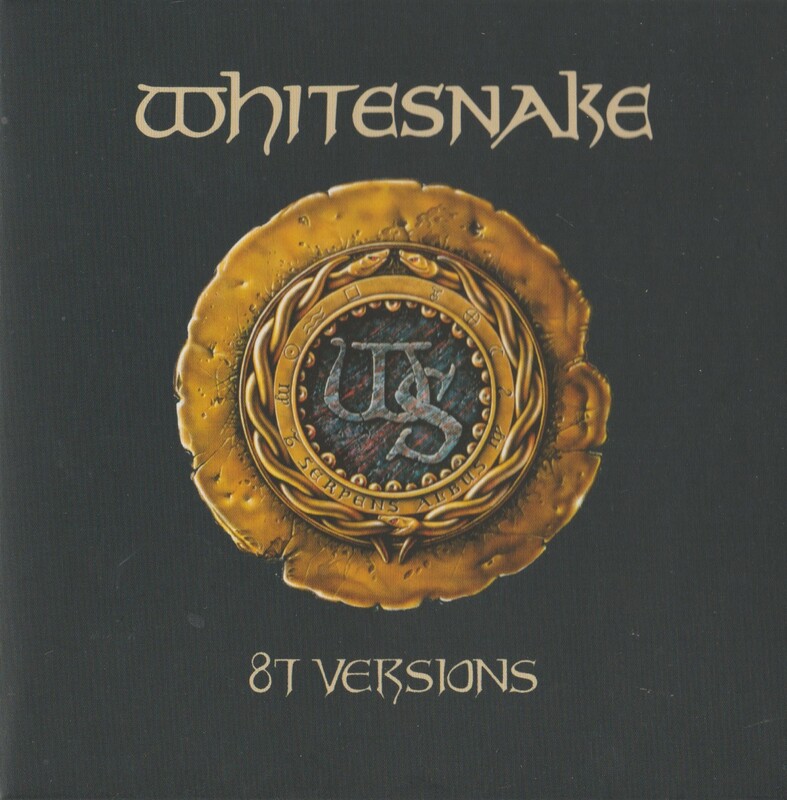 This contains the US versions of all three Geffen-era Whitesnake albums, all the pertinent B-sides except one*, the two UK bonus tracks from this album, and the aforementioned single mixes. 4/5 stars. Great album, but this reiusse could have been so much better. * Still missing on any CD is the 1987 remix of “Standing in the Shadow” from the “Is This Love” single. Here’s my second review from the The Toronto Musical Collectibles Record & CD Sale! It was Japanese import Heaven! For the last installment of this series, click here. Whitesnake disbanded in 1990. Coverdale did his album with Jimmy Page, but that didn’t prove to last either. Although they’d started writing for a second album, the affair ended and David Coverdale assembled a new Whitesnake for a Greatest Hits tour in 1994. This reformation eventually led to an album in 1997 called Restless Heart (billed as “David Coverdale and Whitesnake”. This R&B flavoured album, a personal favourite, did not resonate with some fans of 80’s ‘Snake. After another hiatus, and a solo album (2000’s Into the Light), David once again formed a new group of ‘Snakes, a mixture of old and new members. After several years of touring (and lineup changes), the long awaited new Whitesnake album, Good to Be Bad, hit the shelves in 2008. Former Dio guitarist Doug Aldrich and Winger’s Reb Beach had been a formidable guitar duo since 2002. Similarly to his partnership with Adrian Vandenberg, David has retained his writing style of co-writing with just one co-writer; in this case, Aldrich. It seems to be evident that the guys have gone for a John Sykes guitar sound and style. You can certainly hear a lot of trademark sounds and tricks that Sykes used to do, that gave the 1987 album such a cool sound. This isn’t to say that they don’t play plenty of their own style too, but the retro stuff is frequent. “Can You Hear The Wind Blow” for example directly references moments on 1987, right down to those flares that Sykes used to do. “All I Want, All I Need” equals “Is This Love” Part Deux. Basically, every song on Good To Be Bad is a mash-up of songs from Coverdale Page, 1987 and Slip Of The Tongue, and you can hear the references quite distinctly. “A Fool in Love” is “Crying in the Rain”. “Lay Down Your Love” is “Shake My Tree”, without Jimmy Page. Throw in a little “Kashmir” during “‘Til The End Of Time” (which seems to be based off “Till The Day I Die” from Come An’ Get It) too. Having said that, despite the lack of originality, Good To Be Bad is still a very enjoyable listen, and a very welcome return. A world without David Coverdale’s voice is like a world without crème brûlée. That voice is in fine form, perhaps even stronger than it was on 1997’s Restless Heart. The album has a lot more life to it than Restless Heart, although it does lack that album’s subtlety and R&B moments. The band play great, kicking it on every tune, even the ballads. The melodies are strong and memorable. It’s just…too contrived. The bonus live disc is the the Canadian special edition is highlights from Live: In The Shadow Of The Blues. No big deal. It’s nice to hear Whitesnake playing “Burn/Stormbringer” from David’s Deep Purple days, and cool to hear the old 70’s classics. The real cool version to have is the Japanese release with two bonus tracks. And a sticker! Can’t forget the sticker. The bonus tracks are both remixes (a “Doug solo” version of “All For Love”, and a stripped down version of the lovely “Summer Rain”). For $20, I wasn’t complaining. Slide It In is a great album. I’m very partial to Come An’ Get It, but perhaps Slide It In truly is their best. The production (on the US mix) is absolutely perfect, with Cozy’s drums sounding like drums should sound! Big and loud with lots of emphasis on those rat-tat-tat-tat drum fills of his that I love so much. I personally love 9 of its 10 tracks, only “Gambler” being not my cup of tea. Strangely, the new CD edition opens with “Gambler”. I remember my original cassette opened with the title track! I was very disappointed with the 25th Anniversary edition of Slide It In. It seems hastily thrown together with not much thought given to collectors nor to continuity. 2 tracks are missing from the UK version of Slide It In! (“Love Ain’t No Stranger” – a single, no less – and “Hungry For Love”). They also talk about the UK mix of B-side “Need Your Love So Bad”, but don’t include it. Instead, they give you the version from the “Is This Love” single, from 1987, which has no place on this reissue. 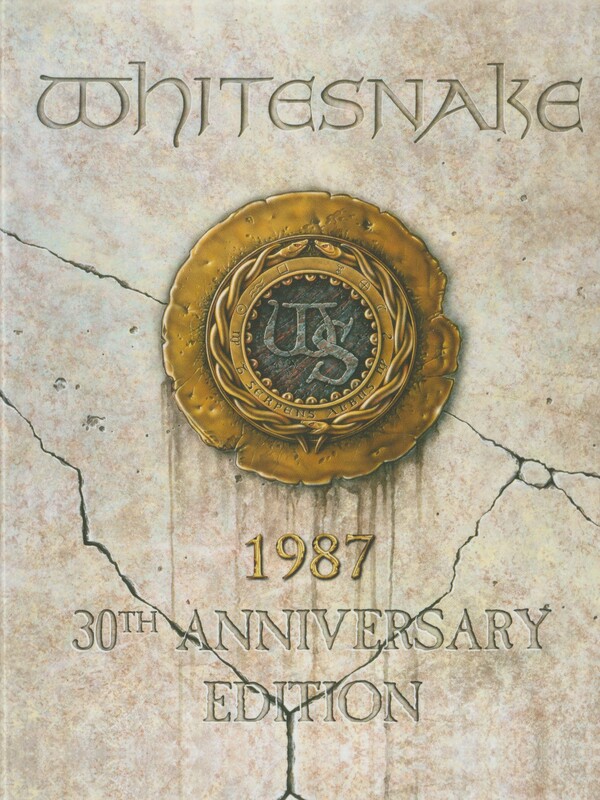 Why isn’t it on the deluxe of Whitesnake 1987? I don’t know! The missing tracks kind of pissed me off. I had hoped to acquire, in one purchase both classic mixes of the album. Instead, I still hunted for and bought the UK version of Slide It In for two freakin’ missing songs. And then to top it off, a live acoustic version of “Love Ain’t No Stranger” from 1997 was included on the deluxe, taking up space that could have been used on missing songs from the period. This unrelated live version is already available on the live album Starkers In Tokyo. Certainly, Slide It In contains some of Coverdale’s most passionate, powerful vocalizing. Just listen to the amazing not-ballad “Love Ain’t No Stranger”. I know, technically, audible breathing is not considered professional singing. But Coverdale uses it as part of his expression. The title track is just an incredible rock song with hints of blues, catchy and powerful, if a tad dirty! “Slow An’ Easy” is the album’s six minute centerpiece. That slide guitar riff…oh man! So perfect. Just perfect. All this is punctuated by Cozy’s tastefully perfect drum fills. This was the album that turned me onto Cozy as a drummer. He immediately became a favourite, largely thanks to “Slow An’ Easy”. As mentioned, “Love Ain’t No Stranger” is another incredible song, a not-ballad with a soaring chorus and mellow,impassioned verses. This is certainly one of the best songs David has written, and he’s written plenty of them. But it’s the only slow moment on Slide It In. This album kicks. “Spit It Out” (oh, dirty David! ), “Give Me More Time”, and “Guilty of Love” are other standouts. I really like “Guilty of Love”, a fast paced fun rocker, with a riff to kill. Just listen to Cozy’s drums! And let’s not forget the classic “Standing In the Shadow”, a song that David later re-recorded in 1987 for the 12″ single “Is This Love”. As with most remakes, the original is superior. The version of Slide It In that I grew up with and loved most of my life was the remix, the US version. The 25th Anniversary deluxe edition contains this version, and the 8 tracks from the original UK mix. What’s the difference then? 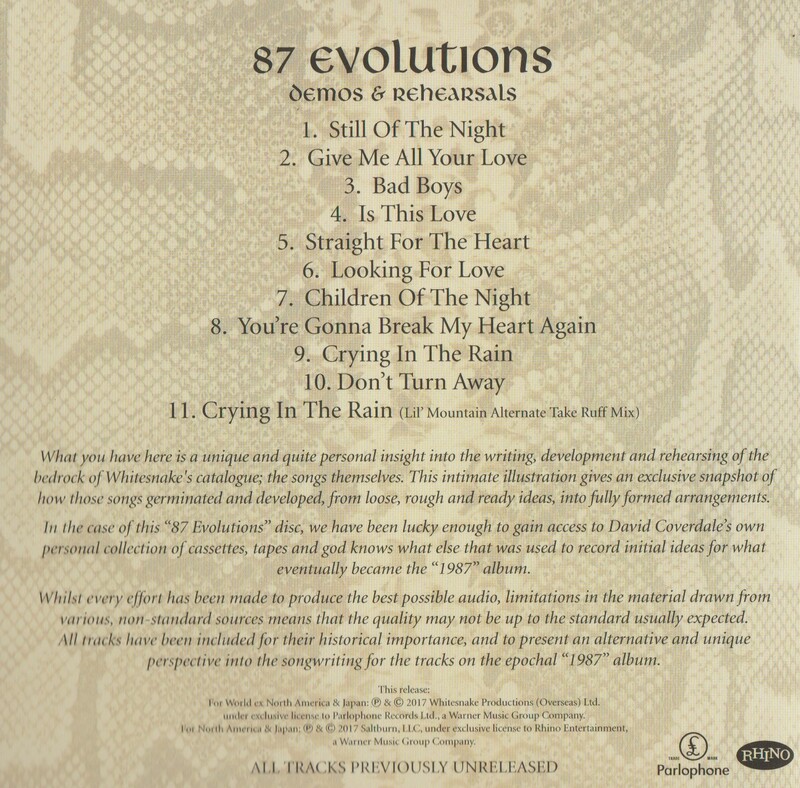 Slide It In was released in the UK with the Whitesnake lineup of David Coverdale and his cohorts Jon Lord (keys), the aforementioned Cozy Powell, Colin Hodgkinson on bass, and guitarists Mel Galley and Mickey Moody. They recorded and released the original version of Slide It In, which came out sounding a little flatter, to my ears. Within a short while Mickey Moody had left the band and been replaced by the more flashy and modern John Sykes, from Thin Lizzy. Hodgkinson was fired and replaced by Neil Murray, who was already a Whitesnake veteran from a previous tenure. Jon Lord went off to rejoin Deep Purple, so Bill Cuomo added more keyboards With Sykes and Murray, much of Slide It In was re-recorded, adding more guitar solos. The album was remixed and released as such in the US to tremendous success.The addition of Sykes’ trademark squeals and a fresh mix made a good but “just another Whitesnake album” into a great and important one, at least for this genre and this band. I prefer the harder edged US version, but they both have their merits. 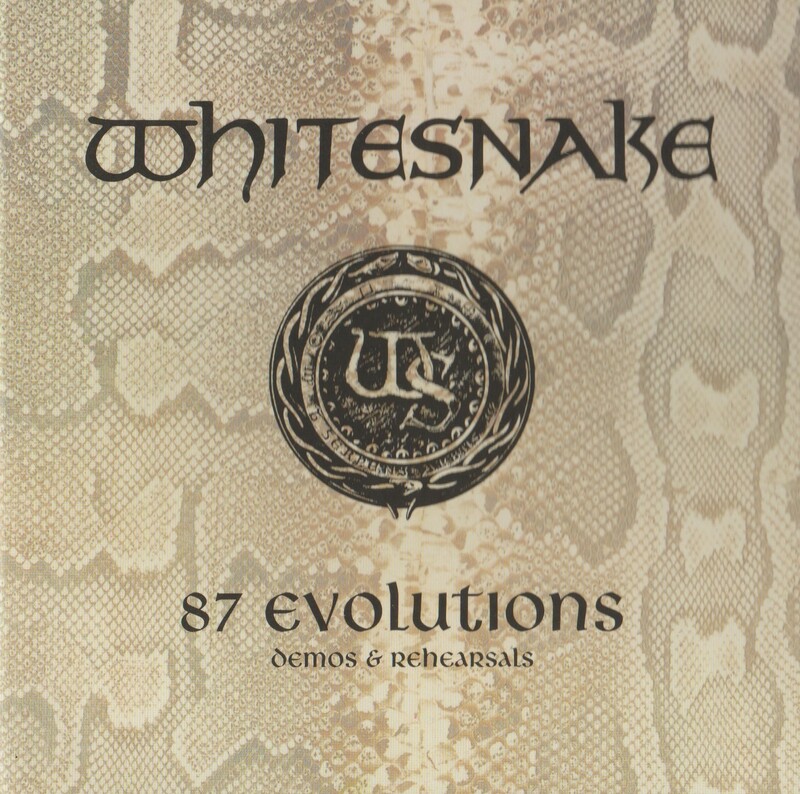 Different solos can be found on the two versions, and fans of 1970’s Whitesnake may prefer the UK mix. Regardless, from that unstoppable slide guitar on “Slow An’ Easy” to the awesome blue-rock-balladry of “Love Ain’t No Stranger”, this is a great album. Even the quiet, soulful B-side “Need Your Love So Bad” is album quality. It just wouldn’t have fit on a record this rockin’. The DVD is fine, all the music videos and a few live tracks from the era are included. 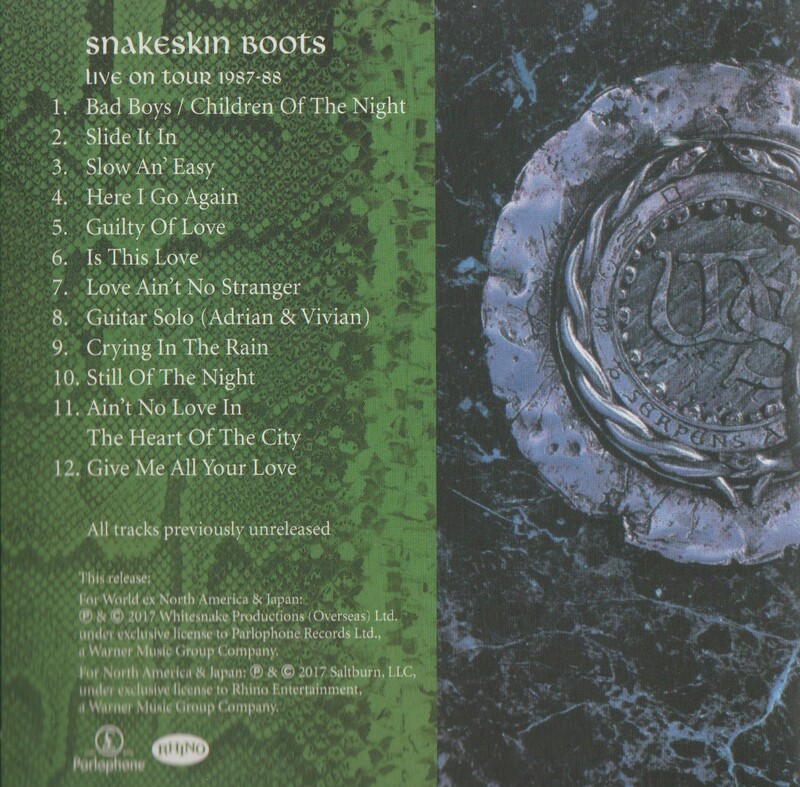 However, once again…a live version of “Love Ain’t No Stranger”, this one from one of the ‘Snake tours in the 2000’s, and also the Starkers version. Why? I don’t know. Why not just release a simple 2 CD set with both versions of the album remastered? I don’t know. The remastering is good otherwise, the liner notes are great, revealing the inner tensions and goings-on with Whitesnake of the time. Slide It In – standard UK version: 3.75/5 stars – the US remix really kicks the songs in the pants!